Home / Parenthood / How Much Sleep Does My Baby Need? As a mom, you have so many questions about what is right for your baby. Breastfeeding versus bottle feeding; homemade versus store-bought food; vaccinating versus not – and it doesn’t stop there. As your child grows, the discussions and debates about what is best for your child continue and you are left to play judge and jury, praying you made the right decision. 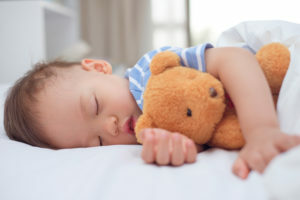 One question you might have is – “How much sleep does my baby need?” Fortunately, there is consensus in the parenting community about how much sleep a baby needs so this is a much easier path to navigate. Whether it is new information or just a refresher, it is always good to double-check that your baby is getting what she needs. The First Month: During those first 4 weeks after you bring baby home, she will be sleeping 15 to 16 hours a day, typically in no more than two to three hours at a time. While people sometimes say that babies have their “days and nights confused,” there really is no confusion. Rather, life for your baby is just one big continuum, and her sleep patterns don’t relate to whether it’s day or night. Sleep, during this stage, looks very restless so it’s normal for your baby to stir, flinch or twitch while they sleep. One – Four Months Old: At this point, your baby is finally starting to sleep in larger chunks, and can hopefully go down for 4-6 hours at night. In total, your child should be sleeping 14-16 hours a day, which is two or three naps a day. This is typically when a baby starts to develop somewhat of a routine and days and nights become clearer. Establishing routines is important during this time, and it’s good to develop a nighttime regimen like bath, feeding, reading or rocking together. As a parent, you also want to ensure that your child has ample play during the day and, when weather permits, outside in the sunshine time, so that she is ready – and tired — for bed in the evenings. Four – Twelve Months Old: As a parent, this is when you start to see some light at the end of the tunnel and hopefully realize it’s not a train! Your child should be sleeping 12-16 hours out of 24 with the nighttime stretching out into 9 or 10 hours of sleep at a time. At this age, many babies have stopped their nighttime feedings, which enables your little one to sleep longer. Naps are still an important part of the schedule and your baby should be taking two to three naps a day. One to Three Years Old: At this point, you enter Toddler Time and your child typically needs about 12-14 hours of sleep every day. It is normal to lose at least one nap, and you may watch this sacrosanct time dwindle to just one or two times a day. Toddlers can have a hard time winding down at night, so as tempting as it is to pack as much into the evening hours as possible, it is really best for your child to maintain an early bedtime and a calm, soothing nighttime routine. With hectic lives and work schedules, it is tempting to keep your little one up but in the end, sleep is more important for her healthy development. So there you have it – recommended sleep guidelines for Baby from birth until Preschool. Or, “A Mom’s Guide to Sanity” because one day, we promise you won’t look or feel as tired as you do now! On a serious note, please know that all children are different and certain factors, like colic or being premature, may influence a baby’s sleep. Knowing what your baby needs and making sure she gets it can be two different things, so do not hesitate to check with your pediatrician if you have questions or concerns.